The Daily Struggles of the Domestic Un-Goddess: chicken. with a side of chocolate. I am a baking and cooking machine lately. After several weeks (okay, maybe months) of neglect, my beautiful and revitalized kitchen is finally serving its true purpose...lots of counterspace for lots of dirty dishes...er...lots of cooking for lots of hungry people. Yup, that's TOTALLY what I meant to say. You'll have to forgive me if this is a little disjointed - it's already after midnight, I should *technically* be in bed and the babe is kicking up a storm and addling my brains. I must say, it makes the formulation of a complete sentence a bit of a challenge. I didn't photograph every course, as some of the recipes are either repeats or are SUPER simple, but don't worry, I'll still share all the deets for ya. Soup - this indian spiced carrot soup from epicurious - this soup was great except for me being an idiot. When I made up my grocery list, I didn't bother to read the instructions - only the ingredients. So it said I needed coriander seed. So I bought some. Had to go to like 3 grocery stores to find whole coriander seed (thank goodness for the ever-accommodating hubs). Of course, when I get home, I find out that the FIRST bloody thing I'm supposed to do is pulverize the coriander in a spice mill. I don't have a spice mill. But i have a heck of a lot of coriander seed....any takers? I did my best to bash it up by taking out my frustrations with a rolling pin....but either the babe has sapped my strength, or my self-perceived vitriolic frustrations are a lot more insipid than I suspected. The result? Icky bits of coriander shell left in the soup....with the odd unpleasant mouth feel of fingernail clippings. Salad was very simple - baby spinach and strawberries with a creamy poppyseed dressing (dressing was easy - 1/3 c. sugar, 1/4 c. white vinegar, 1/2 c. canola oil, 2 T sesame seeds, 2 T poppy seeds, 1/2 t worcestershire, 1 T dijon and about 3 T of whipping cream). Tasty, easy and very pretty. Can't go wrong with strawberries and spinach! I have to say, I was actually pretty pleased with how the main course turned out. I took a bit of a risk in making the chicken (combining two recipes and a little bit of ingenuity), and while cooking time was a little longer than anticipated....the result was great! For all my constant parchment paper pushing, I'd never actually cooked something IN the stuff. I'd cooked tons of stuff ON it, but never once taken the drastic plunge of thoroughly investing my culinary success within its pulpy, shiny depths. I'm not sure why. It's awesome! This stuff was a little slow to cook (likely due to being rolled), but when the initial recipe called for double wrapping and boiling in saran wrap....the bisphenol A-averse little voice in me said...WTF...boiling food in soft plastic? Are they insane? So I sought out an alternative. 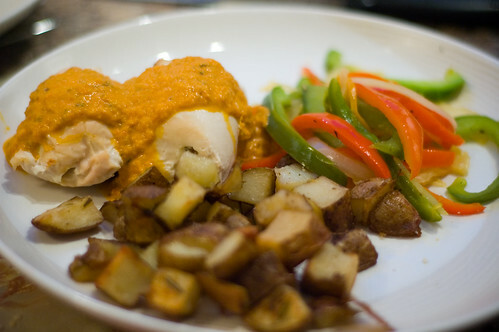 This recipe is a culmination of a chicken recipe from cooking light, a sauce recipe from epicurious, and plain old luck in the cooking method department. 1. Combine boiling water and sun-dried tomatoes in a bowl; let stand 30 minutes or until soft. Drain and chop. 2. Heat oil in a large nonstick skillet over medium-high heat. Add onion, oregano, and garlic; cook 3 minutes or until onion is tender, stirring occasionally. 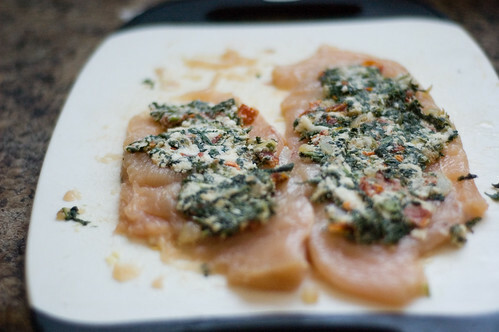 Add spinach; cook 3 minutes or until liquid almost evaporates. Add tomatoes; cook 1 minute. Place spinach mixture in a bowl; cool 5 minutes. Stir in cheeses, 1/4 teaspoon salt, and 1/8 teaspoon pepper. 3. 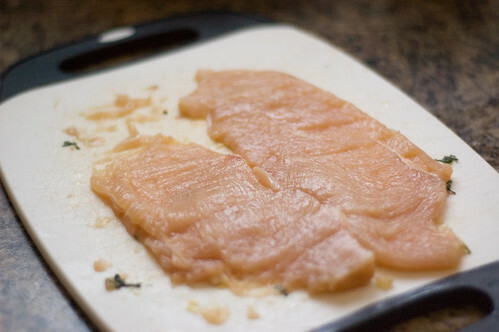 Depending on how big your chicken breasts are, slice each breast half lengthwise through to the other side. Open halves, laying breast flat. Place each breast half between 2 sheets of heavy-duty plastic wrap; pound to 1/4-inch thickness using a meat mallet or small heavy skillet. 4. 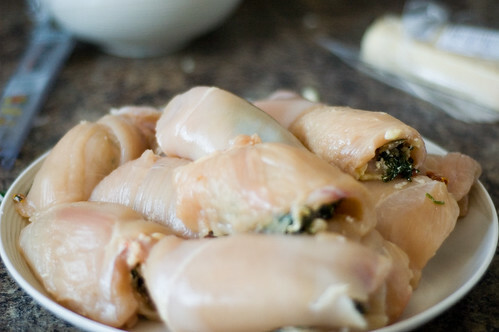 Spread chicken with a thin layer of filling mixture. 5. Roll up, jelly roll style. Set aside and repeat with remaining chicken. 6. 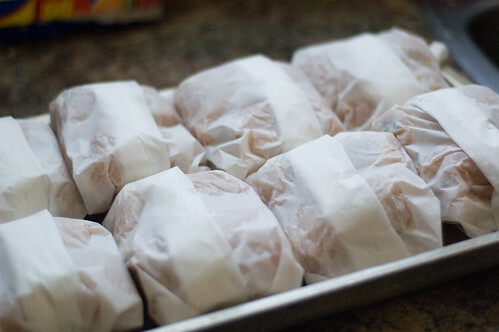 To make the 'en papillote' part - basically, take a square of parchment paper, put 1-2 chicken breast rolls on it, and wrap it up nicely like a present. After much hunting for a handy dandy stapler (no luck unless I wanted to hand fold the staples from the staple gun with pliers....), I opted to just fold mine and tuck them under. There was a small loss of liquid, but really, not that much. 7. Bake at 350F for about 45 minutes to an hour. Make sure you make at least one extra so you can cut into it and check for doneness! 8. To serve, you can put the packages right on the plate (more effective if you do a full meal en papillote), or de-package. I opted to open them myself. 1. In a saucepan, melt the butter. Add the garlic, tomatoes and hot pepper flakes and cook for 3-4 minutes. 2. Add the wine and cook until almost evaporated. 3. Add chicken broth and bring to a full rolling boil. 4. Add the cream (feel free to add a little extra) and boil until somewhat thickened (about 10 minutes). 5. Attack with the immersion blender (or blend with a regular blender for smoother texture). 7. Add in the chopped basil. 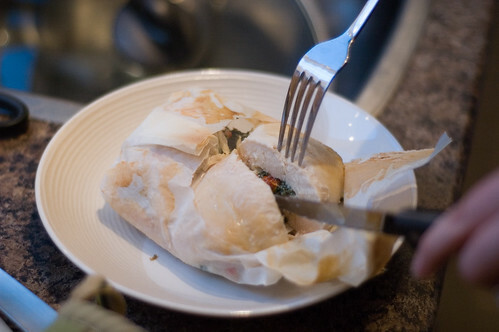 I make something like this but instead of parchment...I use phyllo...your get to eat that too! most impressive, and very nicely done! A gorgeous dinner! I usually use foil instead of parchment paper, but then again, I've only done fish, not chicken. This sounds delicious! We tried the chicken tonight and were majorly impressed. I had a bit of filling left that I simply stirred in to the sauce. Worked like charm. Thanks a lot for the recipe! It's definitely on our "make again/great for guests" list. :D he fingernail part really got me - that's hilarious. I really like the chicken recipe you posted. Seems I'm always running out of ways to cook chicken :). Thanks for a new idea! P.S. It's my first time on your blog, but it's nice to meet you :). Oh, and you look lovely as a pregnant mama-to-be! I only hope, when my time comes around, I'll be able keep my shape the way you have :D!